Jazz tradition meets the natural world. 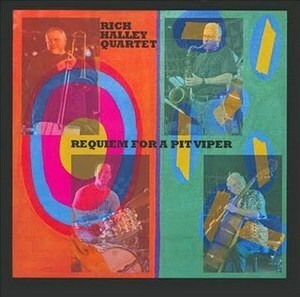 What we have with the Rich Halley Quartet’s Requiem for a Pit Viper is an organic, mighty jazz album that packs a bite with every dense groove and high-level blast. Halley was educated as a field biologist, interestingly enough, and he transfers his love for the natural world to every note of saxophone he plays. His compositions also encompass a larger space, reaching out to the environment outside with one arm and pulling in to a tight, traditional understanding of jazz with the other. This provides a compelling juxtaposition of freedom and form. Halley’s quartet includes trombonist Michael Vlatkovich, bassist Clyde Reed and Rich’s son Carson on drums and percussion. The connection between Halley and Vlatkovich is apparent from the outset. The two have been working together for over a decade. The two Halleys and Reed have also played in a number of groups together, including the Tap Rack Bang Trio and Halley’s Freedom Tradition Quartet (with cornetist Bobby Bradford). Requiem for a Pit Viper, then, is comprised of players who know how to roll with the collective punches. This is important because the compositions run full-throttle, for the most part, throughout the disc. Halley nose for force makes great use of sturdy rhythms, letting his son shine with a number of solos and creative portions. Reed’s bass is tremendous, too, grooving and guiding each number along with a force of energy that can be felt down to the feet. The record opens with the title track, a cut that features an almost funk-rock groove that could be played by the likes of Tom Morello. There’s an urgent slam to the music that really lets it sink in; these cats mean business. And the blend of Halley’s sax and Vlatkovich’s trombone is to die for. The 6/8 trot of “Circumambulation” is nice and smoky, relying in large part on a heavy, almost greasy groove. Carson’s solo fits snugly. The only time things seem to gear down a little is on “Maj,” a meditative piece that, while operating at a slower clip than most of the other cuts, has its own vigour locked in. Halley’s saxophone absorbedly sings the blues while Reed walks alongside. Requiem for a Pit Viper is a dynamic, self-assured recording from the Rich Halley Quartet. With its odes to nature and the tradition of the jazz of Mingus, Bird and Ayler, the record grooves and swings with the best of them.